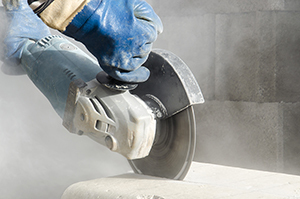 When workers cut, grind, or drill materials that contain crystalline silica like stone, artificial stone, and industrial sand, they can be exposed to very small silica dust particles. These tiny particles are respirable and can travel deep into the lungs and cause silicosis, an incurable and sometimes deadly lung disease. They can also cause lung cancer and other respiratory diseases. To promote safety for those workers, the Occupational Safety and Health Administration (OSHA) recently published a fact sheet summarizing the major requirements of the respirable crystalline silica standard for general industry and maritime. In this publication, OSHA answers the questions of how workers in general industry and maritime are exposed to respirable crystalline silica, what the standard requires, and when employers are required to comply. The fact sheet goes on to give examples of how dust controls protect workers from exposure. Additional information on the standard can be found at www.osha.gov/silica. OSHA can provide guidance assistance through a variety of programs, workplace consultations, training, and education.